SJF Ventures - High Growth. Positive Impact. 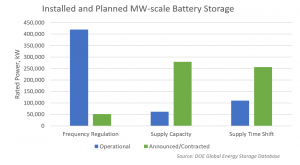 | Energy Storage is Coming Fast! In our most recent blog post, we discussed how venture capital can help scale solutions that mitigate the impacts of climate change. This post will focus on one of those solutions, energy storage, which we believe is at an inflection point within its life cycle. Energy storage has the capability to make the electrical grid far more resilient, clean and flexible. There are a plethora of potential use cases and value streams, well documented in RMI’s Economics of Battery Energy Storage report. Historically these use cases have not achieved significant commercialization, but recently some applications have started to scale up. At SJF Ventures, over the last decade, we invested in the rapid ramp up of solar PV deployment. We first invested in groSolar as a residential and commercial solar installer and distributor. Over time, panel and installation prices plummeted. Utility-scale solar plants looked as if they could compete with traditional fossil generation, so we decided to invest in Community Energy. As utility scale plants proliferated, developers began looking for ways to optimize those assets. We then backed NEXTracker to provide solar tracking systems to help extend production in the morning and afternoon, thus increasing the value on many gigawatts of solar power plants. Two years ago, seeing a similar scale potential for energy storage, we initiated a search for further potential investments. At the time, battery energy storage was entering the scene in niche ancillary service markets. 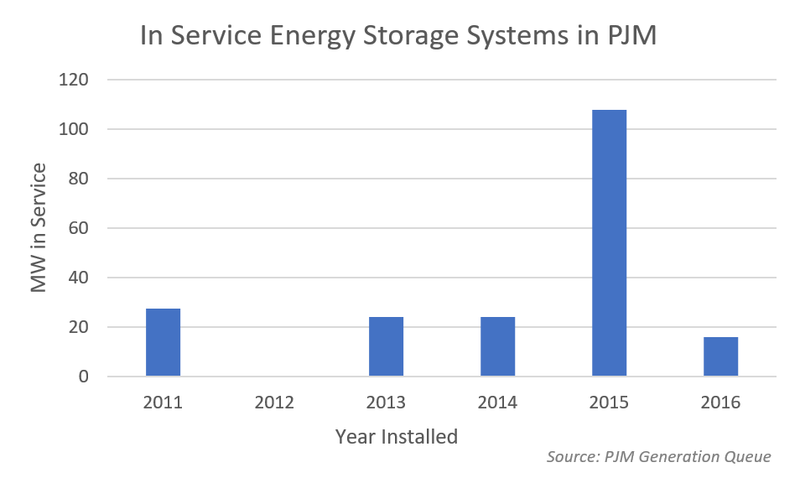 When PJM began rewarding frequency regulation participants for performance, fast-acting energy storage projects quickly outperformed traditional thermal plants. 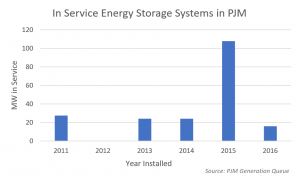 In a rush to capitalize on these favorable terms, energy storage developers moved in, deployments skyrocketed, and it seemed the industry was taking off. However, as shown in our analysis of PJM data below, the frequency regulation market was quickly saturated by 2016. There have been other booms in storage deployment such as in providing C&I customers with peak rate shaving applications, driven in part by incentives such at the SGIP program in California. Firms like Stem, Green Charge Networks, Tesla and others have achieved significant installations but they can often be reliant on specific utility rate structures and incentive grants. SJF has been seeking longer term, large scale energy storage market opportunities. We continue to follow the same approach we took on our solar investments, where we avoided capital intensive, deep technology risks such as in solar cells and modules. Thus, in storage we have looked towards downstream, capital efficient players as opposed to battery chemistry companies. We talked to companies such as Greensmith, GELI, Younicos, Glidepath, Convergent, Demand Energy, Advanced Microgrid Solutions and other leaders in storage software and development. Several of these companies have since been acquired or raised large equity rounds. Corporate acquirers such as Engie, Enel, EDF, Wartsila, Aggreko, and Doosan are looking to diversify their product offerings, manage existing assets, and enter this growing market. We’ve also continued to see traction with energy storage through our portfolio companies. GroSolar developed the first microgrid powered entirely using solar and energy storage. The Stafford Hill Solar Farm site (pictured above) combines over 2.5MW of solar with 4MW of batteries for both clean energy production and emergency backup power for a nearby emergency shelter. NEXTracker, now a Flex company, recently announced an integrated solar-plus-storage product called NX Fusion Plus. In partnering with Avalon Battery, NEXTracker is introducing long lifetime storage systems that may one day serve as baseload renewable energy. Community Energy is now evaluating large scale storage in each of its new utility scale solar developments. New corporate partnerships also signal that the energy storage markets are maturing. AES, already a big energy storage player—recently launched an independent joint venture with Siemens called Fluence, aimed at helping push into new markets and gain market share. Southern Company is making inroads through its affiliate, PowerSecure, and an investment in Advanced Microgrid Solutions. This combination will allow Southern to expand its product offerings in deregulated markets and better utilize the behind-the-meter assets that PowerSecure has deployed. Governments, too, are working to advance the industry. In 2013, California led first with its 1.3GW storage target. More recently, Massachusetts commissioned its State of Charge Report to investigate the potential benefits of energy storage on their grid. The study recommended 600MW of advanced energy storage by 2025 to capture $800M in system benefits. The state ultimately opted for a smaller target of 200 MWh by 2020. Oregon has issued a smaller mandate, while New York and Nevada lawmakers are considering their own policies. Whether via mandates or other market incentives, it is encouraging that states are making energy storage a priority issue. Increased partnerships and favorable policy are positive, but the economic case for solar-plus-storage will likely prove to be the most impactful. Currently energy storage projects charged by solar can piggyback on the 30% investment tax credit (ITC). The ITC will step down, but this incentive is driving much larger deployments, helping to reduce battery and balance of system costs. Since 2014, the cost of lithium ion batteries has roughly halved. As energy storage continues to scale with the EV industry, costs will decline and the economics continue to improve. A recent NREL report predicts that the economics of solar-plus-storage will beat the economics of standalone PV systems by 2020. Declining costs, a favorable ITC, and the ability to time shift cheap renewable energy are already enabling energy storage to be financially viable in many projects. Standalone solar plants are becoming less valuable to regions like the Southwest with high solar penetration. Energy storage can be a good complement to make these plants profitable. With a higher penetration of variable renewable energy on the grid, the value of firm capacity during high periods of electricity demand, particularly in later afternoon, has increased. The recent RFP for peaking capacity by Arizona Public Service Company (APS) makes this clear. Due to the high penetration of distributed solar in its territory and southern California, the utility specified the midday hours of the day as “No Must Take Energy” hours, when the utility will not accept excess electricity on the grid. However, APS rewards power provided in the late afternoon and early evening peak hours. Most of the big names in solar, such as First Solar, have entered the solar-plus-storage game. A recent scan by GreenTech Media showed that of the top ten solar developers in the US, eight have either deployed storage to date, or are currently pursuing it. We believe that this trend represents a shift in the way that solar companies do business. Morgan Stanley agrees, having just released a report on how energy storage is helping renewable energy become dependable and profitable. As shown below, SJF analysis of Department of Energy data shows that the shift away from frequency regulation markets towards capacity and time shifting is happening now. The energy shifting required for renewable energy plants is more in the 4+ hour duration. A Deloitte storage study shows that the market opportunity for 4-6 hour duration is roughly $140 B. However lithium ion technology, which currently dominates the market, is typically suited for shorter duration applications. There are also potential issues with capacity degradation, safety, and disposal with lithium. A number of new chemistries on the horizon, particularly flow batteries, but they are often limited by a lack of bankability or operating history. Given the size and variety of market applications, there may certainly be room for chemistry technologies beyond lithium ion. Of course, beyond batteries, hydro power is a well established energy storage system and other physical formats, such as compressed air or flywheels may emerge for certain applications over time. Despite the challenges associated with developing a new market, there are signs that energy storage is embarking on a sustainable growth path. The market was initially spurred by balkanized markets such as the SGIP program in California or the frequency regulation market in PJM. Tesla’s Powerwall and Gigafactory have captured the public’s imagination, as have electric vehicles, enlightening many on batteries. Also, rapid, large scale deployments to solve grid problems, such at the six month installation of 70 megawatts to address the failure of the Aliso Canyon natural gas site have been big successes. Utilities, developers, and regulators are realizing that energy storage can solve grid problems quickly, flexibly and often less expensively than building new wires infrastructure. Energy storage, combined with solar, wind, electric vehicles, and smart grid technologies, offer the promise of moving us towards a fully fossil-free electric grid. With declining prices across these distributed technologies, it makes little sense to add big centralized coal or natural gas power plants. Energy consumers can now often spend less for no-carbon energy while getting a more flexible and resilient system – for their homes, businesses, industries or cities. Of course, aligned state, local and utility policy will help expedite this cleaner future, along with innovative companies that figure out how to integrate energy storage effectively into their offerings. As a venture capital firm focused on impact, SJF is continuously looking for the next resource efficiency company raising $5MM to $20MM to scale up. We are excited to speak to any software, BOS, development or integration companies working to scale energy storage deployment… as well as other companies driving a positive impact! Dave Kirkpatrick is Managing Director and Harry Masters is an MBA Venture Fellow with SJF Ventures.